Finally: a user experience guide for the data analyst, download your copy today! The most visible part of what the Demos & Best Practices team produces are demos of Qlik software. We create a variety of demos for a variety of industries showing what Qlik can do. The second half of our team's name hints at the other work we do – documenting and sharing best practices. This comes in the form of blog posts (such as now) but also in working with customers & partners to produce better apps, running bootcamps for developers, as well as public speaking engagements. We proselytize UX best practices, tips & tricks, and general Qlik advice to help everyone improve the quality of their applications. Have you been itching for a crash course in #UX for data #analytics? Check this out! The document linked to this blog post below contains a variety of UX topics and gives examples of how these concepts may be applied to application development. Consider it a free crash-course in the basics of UX. From designing for mobile to color accessibility, this document covers different human-computer interaction user experience topics and best practices. Hopefully the topics included can help you improve your existing, or next, application. 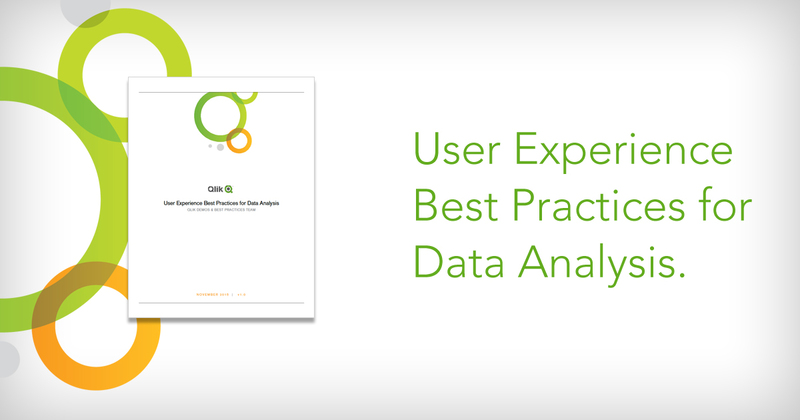 Click here to download our document for User Experience Best Practices for Data Analysis.